This weekend I spent some time in Hershey, PA for the Porsche Club of America's Central PA Region swap-meet. The largest of its kind in the world. Anyway, one of the more interesting non-Porsche's at the show was a mid-1970s Steyr-Puch Pinzgauer. The Pinz was designed in 1969 as a high mobility off road vehicle. Unlike a Unimog it's a pretty competent road vehicle capable of over 60 mph, but also capable of just as much abuse off the road - much more so than your average Land Rover. This example is powered by a 2.5L air-cooled 4 cylinder gasoline engine of Puch design. It also features a four wheel drive system that utilizes a torque tube as a back-bone. The drivetrain acts as a stressed member. The 5-speed manual transmission also has a low-range with 5 off-road gears. All in all, a very impressive machine. Old cars in Utah junkyards. Here's a quick update: various old and rotting cars I have come across recently in junkyards around Utah. Mercedes 190E and 240D, one of several w123s rotting in this junkyard. Fiat 850 Spider, stripped pretty well but remarkably rust free. Lancia Beta HPE. Complete, rust free despite some dents though the engine bearings I found in the passenger footwell may be an indication of what sealed its fate. Renault Fuego, I haven't seen one of these in ages in France or the U.S. Complete (what's missing from the front was in the car) but the junkyard refuses to sell it. As part of a new series of articles here on RWP, let us introduce “Race Oddity” – a look at some of the more unusual racing cars produced throughout history. Of course one of the oddest and perhaps one of the more famous racecars ever made was the Tyrrell P34. Ken Tyrrell’s team started racing in Formula One during the 1968 season with French built Matras to a fair degree of success. The politics of Tyrrell’s French Elf sponsorship combined with Matra’s desire to use their own V12 engine as opposed to the superior Ford-Cosworth DFV V8 led the team to begin development of their own cars in the early 1970s. The first official Tyrrell-made car was released in 1970 and won both driver and constructor titles in 1971. Throughout the 1970s, the team was a significant contender in the F1 arena. For 1976, Tyrrell’s designer Derek Gardner – who previously worked for Matra – came up with the gasp-inducing P34 six-wheeled car. The car used two sets of tiny 10-inch front wheels which both steered, and the Cosworth 3.0 litre DFV powered the rear through a Hewland gearbox. The reasoning for the layout was as follows: with smaller (and lower) front wheels, the frontal area of the car could be reduced and airflow over the top of the wheels could be improved. However, a reduction in wheel size also resulted in a reduction of front-end grip. The solution was therefore to simply add another set of wheels, which effectively doubled the contact area of the steering tires. Adding somewhat to the odd-ness of it, were small windows cut into the bodywork on some iterations of the chassis near the steering wheel to aid driver vision. The cars first ran in competition during the 1976 Spanish Grand Prix, where unfortunately both of the Tyrrells failed to finish, but were fairly competitive throughout the season nevertheless. 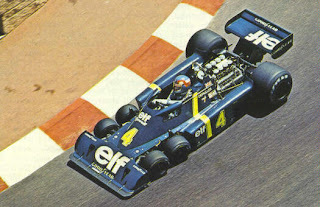 Tyrrell P34s pulled off a 1-2 finish in the 1976 Swedish Grand Prix with drivers Jody Scheckter and Patrick Depallier. The drivers differed on their opinions of the car: Depallier was happy with it, but Scheckter was not impressed at all and was replaced by Ronnie Peterson the following season. While interesting on paper, the additional two wheels at the front also meant more suspension parts and the front of the car, and therefore, more weight. This became problematic for handling. More problems arose for the car when the specially made Goodyear tired proved to be lacking against their normal sized counterparts from both Goodyear and other manufacturers. As Tyrrell was not the tire company’s main concern, development lacked and proved to be detrimental to the P34’s performance. The aerodynamics were improved a bit for 1977, but it was of little avail. The ’76 win in Sweden would be the Tyrrell’s only victory with the six-wheeler, and the P34 was retired for 1978. Mention the name “K-car” to anyone familiar with automobiles and it will likely conjure thoughts of maroon colored 1980’s Chrysler sedans with hopelessly tacky velour interiors and engines with more tappet noise and oil smoke than a German submarine. But there was more to Chrysler’s “K” platform than that. 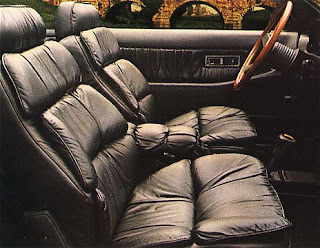 Lest we forget, allow me to re-present one of the auto industry’s more horrid creations of the late 1980s: The Chrysler-Maserati TC – or as it was officially called, the Chrysler TC by Maserati. Alejandro DeTomaso, (of DeTomaso Pantera, Mangusta, etc. 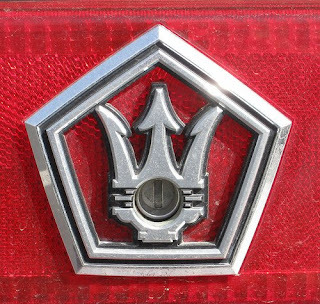 fame) had acquired the Maserati brand in 1975 during a time when the small-scale Italian manufacturer was having some serious financial troubles. DeTomaso of course had some ties with the American auto industry through the likes of the Pantera which used a Ford “Cleveland” V8. This is how he met the man who would later become the president of Chrysler, Lee Iacocca. 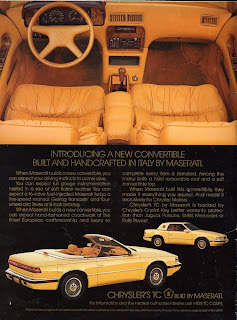 My research leaves me unable to determine who actually spearheaded the idea of Chrysler and Maserati producing an automobile together, and really, either party could be equally as responsible. 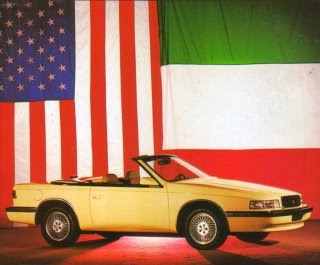 Nevertheless, in 1984, Iacocca and DeTomaso joined forces to develop a sports car based on the Chrysler K-platform. The car would become known as the TC (for "Touring Convertible" presumably… it even came with with a removable hard top complete with gaudy port-hole windows). The TC utilized Chrysler’s platform, K-engine architecture, and even hopelessly uninspired LeBaron-esque styling. Underneath the car utilized parts from the Dodge division’s Daytona rather heavily in the suspension area. The TC was actually assembled in Italy but still managed to deliver endless amounts of Detroit’s patented bastardized badge engineering. 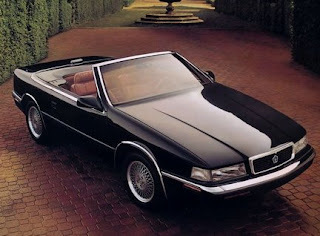 The “Chryslerati” was first shown to the public in 1986 and finally in 1989 the first models (proudly sporting the Maserati trident inside of a Chrysler pentagon) were put up for sale for a rather princely $33,000+ price tag. Inside the TC sported plenty of over-stuffed leather and Mopar bits and pieces. The interior design was hardly what would be called ‘rich’ despite all the cows that died for it. Though to be totally fair, it did fit in with the overall concept of the car that had more or less turned out to be about as classy as a middle-aged man in a tan leisure suit sporting a fake Rolex. The first engine offered in the TC was a K-based 2.2 liter, turbocharged, inline four cylinder. The pedigree of this engine can be traced to such illustrious Mopar models as the Plymouth Reliant K and Dodge Aries K. There are many differences however. Enter, the Maserati connection. Maserati engineered much of the modifications to the 2.2 K unit which would find itself in to the early TCs. England’s famed Cosworth produced its special 16-valve heads which where then shipped to Italy for Maserati to finish off and mate together with the rest of the American built components, save for the Japanese IHI turbocharger. These “Maserati” engined models also featured the only manual transmission of the TC’s history – a 5-speed Getrag from Germany. Unfortunately, most of the cars were automatics that were mated to typical 175hp Chrysler 2.2 turbocharged K-engines that were also found in Dodge Lancers and Daytonas. For the last two model years of the TC, Chrysler decided to do away with all hints of any kind of Maserati heritage and use a Mitsubishi sourced 3.0 liter V6 lump that would also live on in various Chrysler products for years to come. In 1991 the plug was thankfully pulled on the TC. Less than 7,500 of these Italian-made Detroit disasters were made and Iacocca and his boys decided to focus their meddling in the Italian auto industry on Lamborghini for the next few years. But that, of course, is another story. Once we've received a few we'll post an article about our illustrious winner. Spotted here in State College today was this circa 1972 Fiat 124 Spider. As would be expected of a Fiat, particularly in this part of the country, it has some rot in the body. The bottom of the rear fenders are looking a little lumpy, but all it all, a fairly presentable driver. Good to see the old chrome bumper Spiders still out there. The original style bumpers and door handles really help show off the classic Pininfarina lines. It even looks good with the top up. Compare that to an MGB. Arched rear fender lines are trademark of designer Tom Tjaarda who also penned the DeTomasso Pantera. Surprisingly free of camouflage, I believe this is the new F-250 that Ford has planned for 2011. With three doors, it's even more practical than the last one. It's not as hard to park as you'd imagine, simply take up two or even three spots and you're golden. This appears to be the short bed version but there is talk of a long bed dually model. Everyone has been talking about this new truck because it is the model that could singlehandedly save Ford. Analysts say this will be a hit with consumers whether they currenty own a truck or not. The truck also had Idaho plates which confirms the rumors that Ford is moving from Dearborn to Coeur d'Alene. The John Deere 750 is yet another case of badge engineering by the Americans. Thankfully, these boys from Iowa teemed up with the right people. 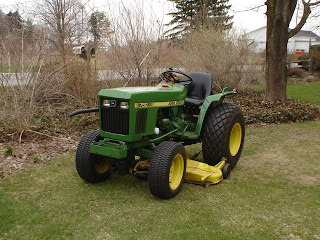 When John Deere was in need of a more compact tractor model, they looked to famous diesel engine builder Yanmar of Japan who were already producing such machines. 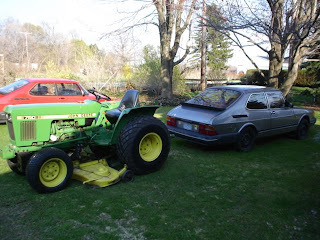 The resulting partnership would spawn several small diesel powered agricultural tractors ranging from two to four cylinders throughout the 1980s. 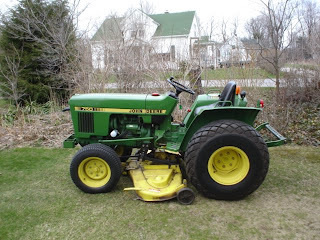 This particular example is a 1984 John Deere 750 with a mere 700 hours on the clock. Primarily it’s use is mowing vast expanses of grass, but it has also proven itself to be very competent at pulling trees over, hauling massive loads of brush and logs, dirt plowing, and lifting heavy objects and towing dead cars. The engine is a three cylinder Yanmar diesel with a displacement of 1.3 litres and 20 hp. It provides the tractor with ample torque and is remarkably fuel efficient and smooth. In nearly 25 years of service, it’s only mechanical malfunction has been a water pump failure. The redline is just under 3,000 RPM and the throttle is controlled either by a hand-lever or, for short bursts of acceleration, a foot pedal to the left of the brake pedals. The engine drives a non-synchromesh transmission with high and low range operating on four forward gears and one reverse, effectively making 8 forward and 2 reverse ratios. In top gear, at roughly 2,500 RPM, the top speed of the 750 is around 15 mph. Models equipped with agricultural tires tend to be slower than this model, which is equipped with Bridgestone turf-tread tires. Gear changes can be tricky, especially at cold operating temperatures, but a direct linkage to the gearbox ensures an accurate gear selection. The clutch is mechanically operated, though not too terribly heavy for a vehicle of this sort. Brakes are encased within the differential at the rear, and are also mechanically operated. They are adequate, though some significant effort may be needed to slow the 750 from full speed. The engine block, transmission, and differential are all stressed members - just like a Formula One car! Also operated from the engine are two power-take-offs or PTOs. The rear is directly linked to the transmission and can be engaged mechanically with a lever below the seat for powering machinery. The front PTO is engaged by an electric clutch via a switch on the instrument panel. 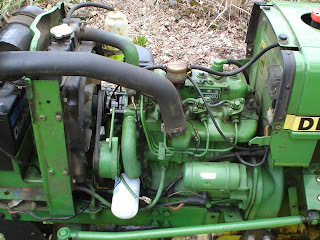 This drive also operates the mid-mounted mowing deck that this particular example is equipped with. Steering is fairly heavy at a stand still and non-assisted. This can make low-speed maneuvers a little difficult, but the precision and ease of the steering increases dramatically when the tractor is moving. Driver comfort is fair, though after several hours, the low backed seat and stiff ride of the 750 can become uncomfortable. Under heavy operating loads, such as mowing for example, the mechanical noise can be quite loud as well. However, all of the controls are easy to use and fairly intuitive. Instrumentation is limited to a tachometer that incorporates an hour meter and three warning lights for charge, oil pressure, and temperature. For nighttime operation, there the driver can select lighting preferences from a rotary knob behind the steering wheel. They are flashing-ambers, flashing ambers with low beams, high beams, and a rear-mounted work-light that can be positioned as desired. 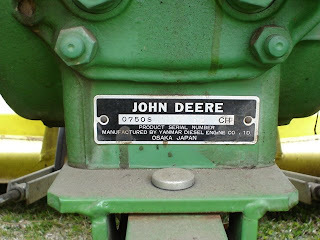 While John Deere may very well be one of the most American industrial icons, this re-badged offering from Japan really raised the bar for the tractor industry in its day and still remains a very practical choice. It has low operating costs, easy usability, and is exceptionally reliable.